President Michael Sata must come out of State House and show exemplary leadership by resolving the current political crisis being experienced in the country, says MMD spokesperson Dora Siliya. Ms. Siliya who is also former MMD Petauke Central Member of Parliament said that the PF and President Sata must know that the country’s freedoms and rights were being abused by his government. “The PF must heed to an old adage that when the government is afraid of its own people that is democracy but when the people are afraid of the government, it is then dictatorship. I believe that in Zambia we have arrived at a dictatorship, just like in Adolf Hitler’s time, he went after the Jews everybody was quiet and the Romans thought it did not affect them, then he went after them everybody was quiet again including the protestants because they thought that it did not affect them,” she said. Ms. Siliya said that the current political instability and the lack of leadership by the PF in the manner they were governing the country was worrying as the country was being pushed to a crossroad, just as it was in Hitler’s time. “He finally went after the protestants and everyone else, we know what the disaster was and its results from Hitler’s rule and I believe that in this country we too must learn lessons. Wherever in the world a government starts intimidating its own people, whenever a government starts using the police to intimidate people, they begin to use the judiciary and hooligan with machetes, begins to go against journalists then something has gone wrong,” she said. 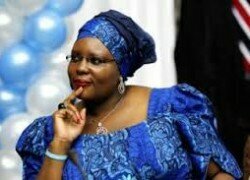 She said that it was time the people of Zambia refused the kind of leadership President Sata and the PF were providing to the nation as finally it would not matter whether one was not PF or PF. Ms. Siliya also urged the minister of Home Affairs Edgar Lungu to show maturity in the manner he was running the ministry because it was perceived that his ministry was abusing the rights of the people. “I also know that he has acted as president a few times Mr. Sata has been out but that doesn’t make him President. He must be counseled that government cannot use the police and other institutions of government to intimidate citizens. I believe that Zambians should now stand up and stop this. It’s now time to speak up, they must know that this is not the government people wanted; Zambians wanted a government that would address the difficulties they are facing such as unemployment, farmers wanted a proper market for their produce at competitive prices, and the people wanted a government that would have respect for the people and human rights,” she said. She said that the new trend the PF regime has developed of arresting Journalist was a sign of broken rule of law. Ms. Siliya said that it was unreasonable for government to have its people continue living in constant fear of harassment, intimidation because of having divergent views. “Arresting Journalists, imprisoning them without charge or indeed slapping them with frivolous charges is aimed at intimidating them and abusing the rights of the citizens to have free access to any media they want. When you go to beat up church leaders you are not only intimidating those church leaders but even the followers. This government is intimidating everyone, union leaders, the church, journalists, politicians and students and not forgetting workers,” she said. She wondered whether the current political crisis was as a result of the absence of the head of state saying the country needed real prayers as it was at the crossroads of leadership.